The Philippine Institute of Volcanology and Seismology (PHIVOLCS) has issued Tsunami Alert Level 3 in the following provinces: Northern Samar, Eastern Samar, Leyte, Southern Leyte, Surigao Del Norte and Surigao Del Sur. All these provinces are facing the Pacific Ocean in the east. 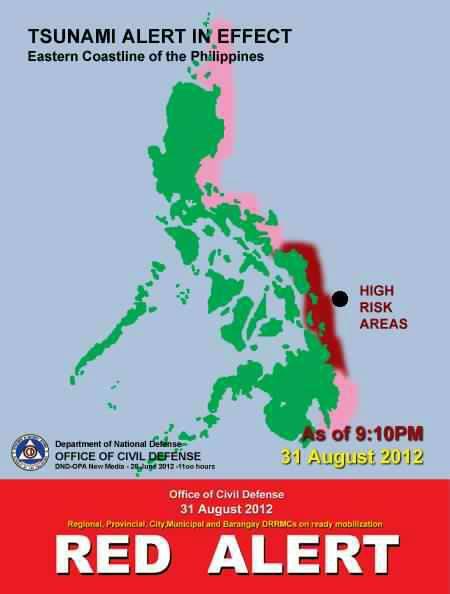 People living near coastal areas in the said provinces are urged to evacuate immediately. Netizens are using the hashtag #phtrenchquake for updates and advisories about this earthquake. UPDATE, 11:30PM – Hawaii, United States-based Pacific Tsunami Warning Center (PTWC) has lifted its tsunami warning for the Philippines. However, the PTWC stressed in its report that “ONLY NATIONAL AND LOCAL GOVERNMENT AGENCIES HAVE THE AUTHORITY TO MAKE DECISIONS REGARDING THE OFFICIAL STATE OF ALERT IN THEIR AREA AND ANY ACTIONS TO BE TAKEN IN RESPONSE.” NDRRMC Executive Director Benito Ramos stressed that PHIVOLCS is yet to lift its tsunami warning for the abovementioned areas. According to the PTWC, when no major waves are observed two hours after those were expected to arrive, local authorities can assume that the danger has passed. It also warned that boats and coastal structures will remain in danger for the next several hours because of rapid currents. The province of Bulacan will have two local holidays within the next two weeks: Marcelo H. Del Pilar Day on August 30 and the Araw ng mga Barangay on September 11. The two aforementioned dates are listed as annual provincial holidays in Bulacan’s Administrative Code, which was signed by then-Governor Josefina Dela Cruz back in 2007. Click here to download the Administrative Code of Bulacan (in pdf format). Born in August 30, 1850, Marcelo H. Del Pilar is considered as one of the pillars of the reform movement during the last two decades of Spanish colonization of the Philippines. Del Pilar used the pen name Plaridel, and his colleagues in the revolutionary newspaper La Solidaridad include Graciano Lopez-Jaena and Jose Rizal. Del Pilar is Bulacan’s provincial hero. Smart Gilas Pilipinas national basketball team clinched the 2012 Jones Cup title by beating team United States, 76-75 in their August 26 match. Down by as much as 14 in the third quarter, players LA Tenorio and Marcus Douthit powered the Philippine team’s successful title bid. Tenorio scored most of his game-high 20 points in the final period. Like in past tournaments, this year’s Jones Cup follows a single round robin format. The Philippines men’s national basketball team won the gold medal by ending the tournament with the best win-loss record. As of posting time, the the next three positions in the team standings has not been finalized. After dominating the first two quarters, the American team wavered in the dying minutes of the third quarter, allowing the nationals to cut the deficit to eight. Tenorio went on to score seven of the Philippines’ first nine points in the final canto. A shootout from both squads turned the game into a seesaw battle until its final moments. This is the country’s fourth Jones Cup crown, while the United States has won the tournament 15 times. The Philippines last topped the Jones Cup tournament in 1998 (courtesy of the Philippine Centennial team under the mentorship of then-Alaska Milkmen head coach Tim Cone). Veteran mentor Chot Reyes is now on his second stint as Smart Gilas Pilipinas head coach. The win snaps a decade of heartbreaking losses for the Philippines to teams such as South Korea and Jordan, which began during the 2002 Asian Games. PS: The team that carried the US banner in this year’s Jones Cup is not the one that won the gold in the recently-concluded 2012 London Olympics, which was led by Kobe Bryant and LeBron James. However, it must be understood that the US has never sent a team composed of NBA superstars to this particular tournament. 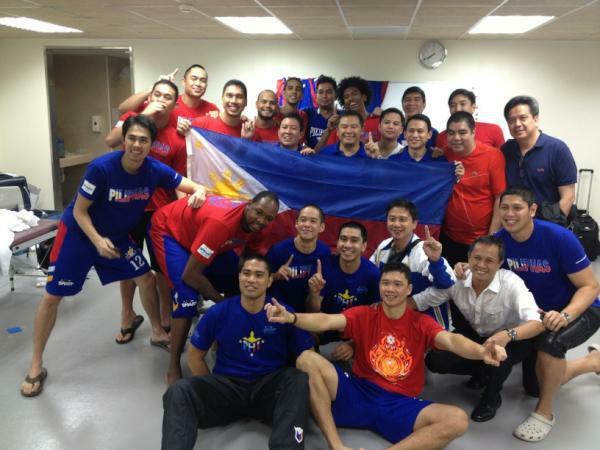 Smart Gilas wins 2012 Jones Cup title, 76-75! 0:08, PH 76- US 75 – PH with possession! 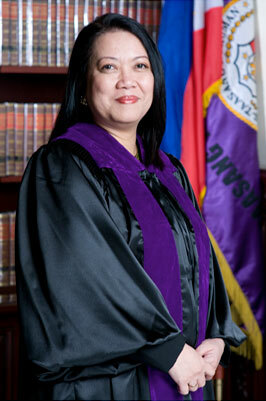 President Benigno Aquino III has appointed Supreme Court Associate Justice Maria Lourdes Sereno as the new Chief Justice. Sereno will succeed Renato Corona, who was impeached from his post last May 29. 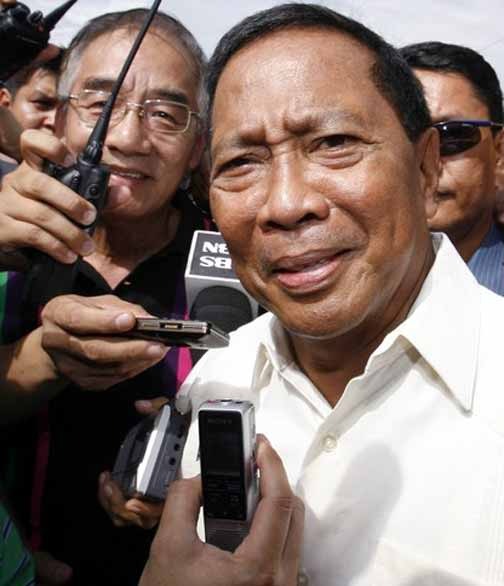 The announcement came three days before the August 27 deadline for Aquino to name a successor to Corona. “In the midst of this period of deep mourning for the loss of Interior and Local Government Secretary Jesse Robredo, the President is cognizant of his constitutional duty to appoint the next Chief Justice of the Philippines. He has therefore decided to appoint Associate Justice Maria Lourdes Punzalan Aranal-Sereno as the 24th Chief Justice of the Supreme Court. The list of public personalities embroiled in plagiarism scandals in different contexts has gotten longer recently. Early this year, the House Justice Committee voted to impeach Supreme Court Associate Justice Mariano del Castillo for plagiarizing excerpts from a foreign journal article parts for a decision he penned. 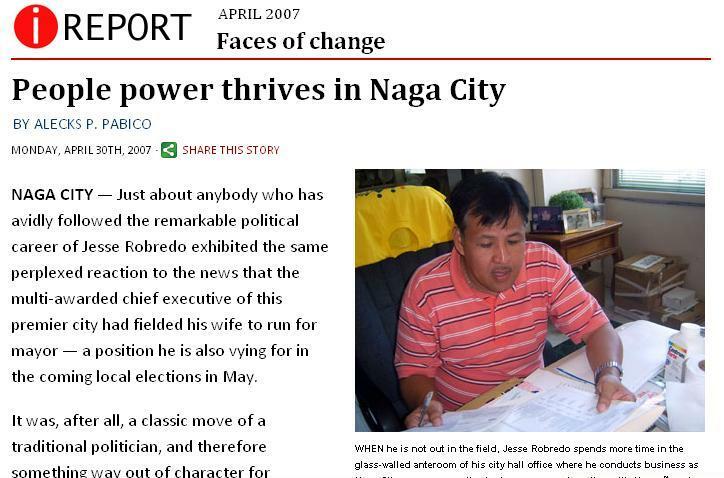 A year before that, Palanca-award Hall of Famer Krip Yuson was found to have plagiarized another writer’s work for a magazine article. Overseas, Hungarian president resigned last April after it was revealed that he plagiarized parts of his doctoral dissertation twenty years ago. Just this August, Time magazine managing editor and CNN TV host Fareed Zakaria was slapped a one month suspension (which has since been rescinded) for writing a column which contains a paragraph copied without any attribution from a New Yorker article. 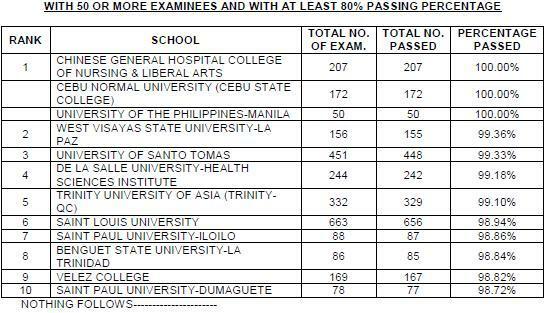 Sotto is obviously in good company. Plagiarism in educational institutions is considered a crime. For example, professors at the University of the Philippines can refer students who are caught plagiarizing in the Student Disciplinary Tribunal for due process. If found guilty, erring students can face any of the following penalties, as stipulated in the Student’s Code – suspension, expulsion, and revocation of the degree earned (if the act is discovered after the student has already graduated). Aside from being ridiculed publicly, plagiarizers outside the academe do not really have to worry about any legal consequence. Will an author whose work had been plagiarized go as far as filing a case against the offending party in relation to the Intellectual Property Code? In the present Congress, Rep. Winston Castelo of Quezon City proposed a bill that recommends tough sanctions against guilty individuals. Download Castelo anti-plagiarism bill here. Last Wednesday, the Senator-comedian delivered part II of his so-called “turno en contra” on the reproductive health bill. The full text of his speech can be read in the Senate website. Two days before that, he made headlines by claiming that the 1975 death of his first son with actress Helen Gamboa was caused by a contraceptive pill (a claim immediately rebutted by former health secretary Esperanza Cabral). Aside from the loopholes in Sotto’s arguments, it was also discovered that huge chunks of his two speeches was copied word-for-word without proper attribution from FIVE BLOGGERS. Blogs can be a useful source of information, and yes, as Sotto and his chief-of-staff contends, their contents are readily available in the public domain. However, information obtained from blogs should be treated with a grain of salt. The easiness by which one can put up a blog is the medium’s greatest weakness. Aside from being poorly written, many blogs out there contain trash. Nevertheless, Sotto’s aides are still guilty of sloppy researching. Why settle for a secondary source when accessing the primary reference will take you just a few minutes more of researching? This is the problem with those who rely on Wikipedia hook, line, and sinker. Rather than relying on what a Wikipedia article on a certain subjects says, researchers should check out the list of references at the bottom of the said page instead for fact-verification. The plagiarism scandal involving Sotto has now been reported in ABC News, Washington Post, The Guardian in Great Britain, and many other foreign media outlets. This whole episode should raise awareness not just among politicians but to everyone that detecting plagiarism is as easy as perpetrating the act itself, thanks to online search engines. In this particular case, online users not affiliated with media outlets are the ones that first proved Sotto’s plagiarism. 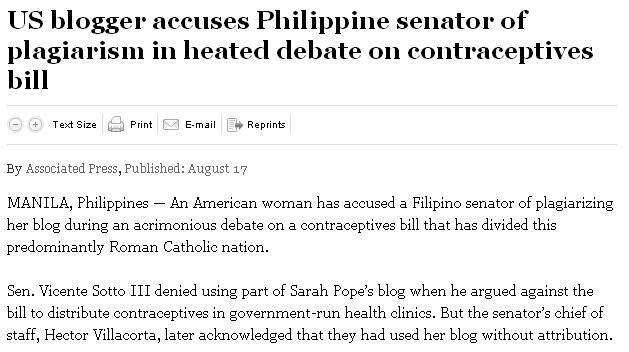 Two factors have worked against Sotto:1) Google has made it almost effortless to detect plagiarism, and 2) The dubious nature of Sotto’s claims in his speech (ergo, that a contraceptive pill caused the death of his first child) naturally invited scrutiny into it. What should we expect from here? 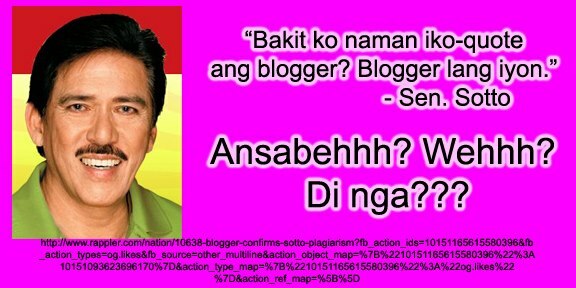 Sotto is not likely to face any legal charges for what he did (hence, he had the gall to dare bloggers to sue him). Concerned parties may instead file a complaint against Sotto through the Senate Ethics Committee but it is improbable for Senators to censure one of their own. Even more preposterous is for anyone to expect Sotto to resign his Senate seat. His term ends in 2016, and he is eligible for reelection. As it is, engaging in plagiarism in school can get you expelled, but if you’re an honorable senator, plagiarism carries no tangible consequence. Postscript: Red Tani of the Filipino Freethinkers has published an article questioning the scientific credentials of Dr. Natasha Campbell-McBride, Sotto’s alleged expert source. Before you concern yourself about citing an author properly, you should first assess the credibility of that source.